After a lost food notebook scare (from our Portugal and Spain trip), I’ve decided to start digitally documenting the meals enjoyed during our travels. These posts won’t be too detailed, but I will include where we ate, what we ordered (and some pictures), how much it cost, and an overall comment on the food/restaurant. I’m starting at the beginning with Venice 2009 and will work my way through London 2012. So, without further ado: Venice! 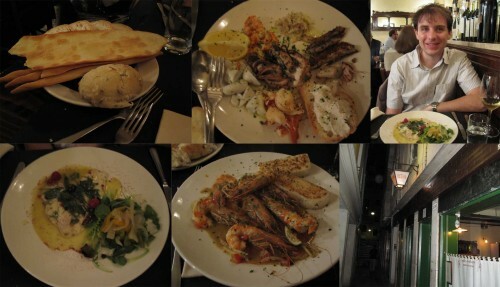 With a few exceptions, our food choices in Venice focused on anything from the sea. Since it was a first trip to Italy for the both of us, we also made sure to try pasta and pizza, the Italian staples here in the US. Nothing we had was disappointing and after this trip we have continued dreamt of the Venetian cuisine. One tip I’ve recently read is to visit the morning fish market to see what’s for sale – that will give you an idea of what is fresh from that day when you are ordering fish later that night for dinner. I didn’t even think of that on this trip, so I stuck to whatever sounded delicious (and it never led me astray). 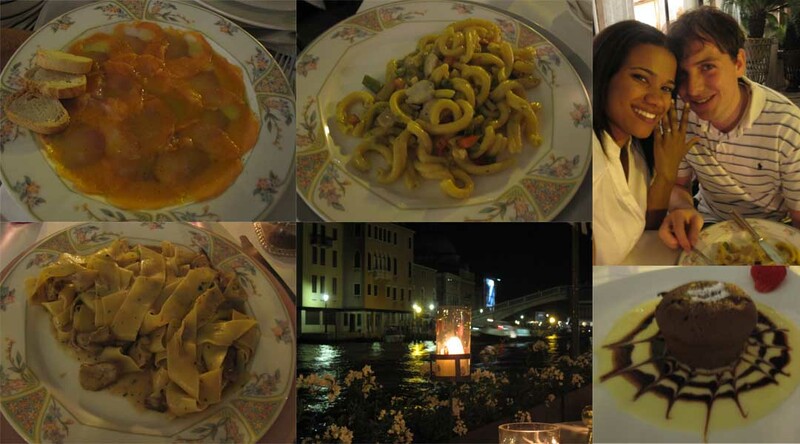 Price: $$ – not bad for a (presumably) touristy restaurant right on the Grand Canal. Overall thoughts: I was so happy with our first meal in Italy. Yes, it was on the Grand Canal, so while it may have been a touristy place, the prices were reasonable and the food was fresh and light. My seafood pasta was delicious (the spaghetti was cooked al dente, perfection!) and Ryan’s pizza was so good that I wanted to order pizza the next day (I used to eat pizza very rarely, so this was a big deal!). The view was also a huge plus. We had just arrived in Venice, so it was my chance to admire the Grand Canal for the first time. Price: $$ – the total bill was right around €25, and we left about €2-3 for the tip. Overall thoughts: A great choice for lunch in Burano. It was very crowded, but we were able to sit right away and didn’t have to wait long for our food. The mussels were delicious (especially with extra lemon juice squeezed on top) and the seafood pizza was very unique, but tasty! I would definitely consider revisiting on another trip to Burano. Overall thoughts: the gelato was creamy and rich everywhere, and the flavors were inventive compared to the standard ice cream shops in the US. I’d maybe skip the sandwiches, which were just okay (were sold just off of Piazza San Marco and were €4 each). The cappuccino stop provided a quick rest during the busy day, and it’s something we should have made time for more than just once! Price: $$$$ – the bill came to €95 for one shared appetizer, two entrees (€25 each), a bottle of wine, and a bottle of water. Overall thoughts: absolutely fantastic. This is the type of restaurant I wish we were always able to find. We were extremely lucky – we were looking for a different place and stumbled upon Alle Testiere around 10:00pm. Unfortunately, they had a limited menu, but they agreed to sit us at the one free table. We later found out that they have two seatings for dinner and we were about 45 minutes late for the second one. Even with the limited menu (no pasta), the meal exceeded our expectations. The appetizer started a continuing trend of ordering mixed appetizers featuring specials from the area (it also began my love for cuttlefish). A great find, and a restaurant I will track down again the next time I’m in Venice. 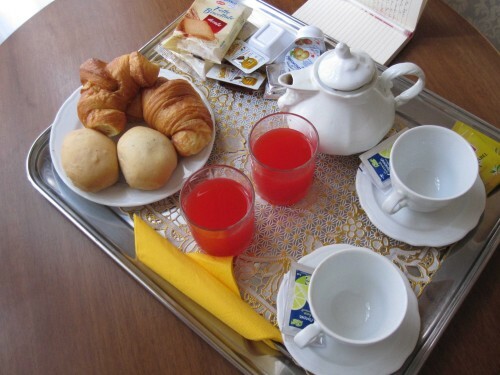 Overall thoughts: it was great to have the breakfast included in the hotel. We missed it our first morning because we were out and about so early. It was much better than paying €5+ for a smaller croissant and a bottle of juice! Price: $$ – a bit expensive for small portions, but it wasn’t bad. Overall thoughts: the food was delicious and the are was tucked away from the main tourist route. Meal: Dinner at Hotel Principe (Sept. 6, 2009) – the engagement dinner! Price: $$-$$$: I didn’t write down pricing information, but made some guesses in my notes (maybe around €15 for the appetizer and each entree). Overall thoughts: Another great view, if you aren’t trying to stay away from restaurants on the Grand Canal. I think the raw fish appetizer was salmon, and it was fresh and tart (from the citrus). It satisfied my “sushi craving” during the Italy portion of our trip! The homemade pastas surpassed my expectations and the unusual combinations (scallops and asparagus!) played with our tastebuds. It was a great way to celebrate our engagement! 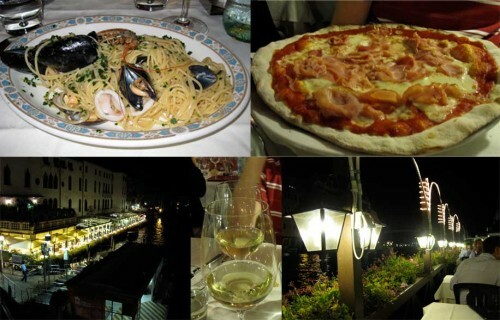 Our next trip to Venice will feature similar foods (fresh seafood being the main objective), but more attention will be paid to choosing the restaurants. I wish I had a better memory of my thoughts on the food, but luckily my journal provided some insight and brought me back to Venice for a few moments. My stomach cannot wait to get back to Venice to experience some of the best seafood and pastas that it has ever tasted! This entry was posted in Food, Food Run-Down, Travel and tagged food, Italy/France 2009 Trip, Venice by Kristin. Bookmark the permalink.